JayWalk - All Your Xmms Are Belong To Me: Wine Wine Wine! 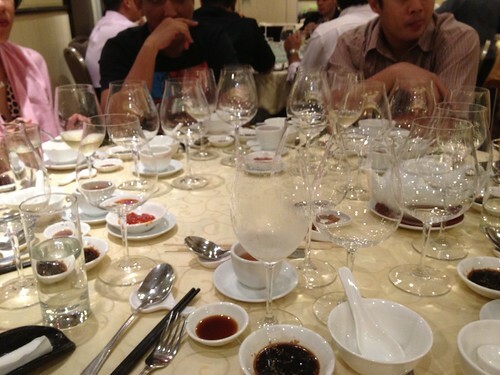 You know I am with a bunch of wine fanatics when the glasses outnumber the plates and bowls on the table. I was back in Singapore earlier and decided to do a bit of catching up with some of my Uni mates, whom I have not seen in quite a while. We were all best buds all the way back then and were each others' wedding groomsmen. Yeah. We were that tight. 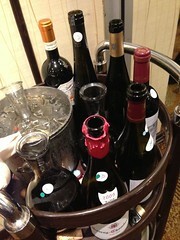 The dinner was at Jade Palace at the basement level of Forum The Shopping Mall where corkage is waived to encourage BYOB. As you can see, we were very very encouraged that night. LOL. I was also very impressed with the staff handling our wines. A little numbered sticker on each bottled and each corresponding glass on our table. These guys really know their shite.